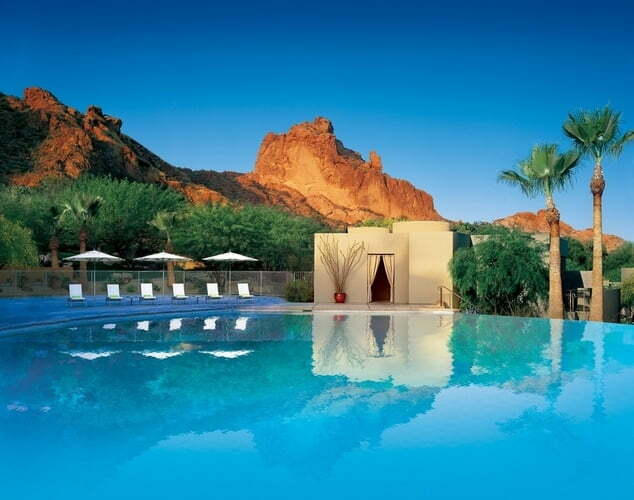 From your mountain or spa casita at the boutique-style Sanctuary on Camelback Mountain Resort & Spa, enjoy views of the dramatic rock formations and mountains that make this setting so inspiring. Renew while indulging in Asian-inspired spa treatments or relaxing in the bamboo courtyard. Your recently remodeled suite boasts an outdoor balcony for stargazing and a wood-burning fireplace for cozying up. Dine on farm-fresh American cuisine by Food Network star and Executive Chef Beau MacMillan at elements restaurant. Watch the breathtaking sunset from the elements deck or in jade bar with specialty cocktails and small bites. > Based on availability at time of booking.